Ideal location to Gatwick. Friendly front desk staff. Comfortable bed. Quiet and relaxing. The Crowne Plaza Felbridge is around 15 minutes form Gatwick and the ideal venue for a pre-flight stop-over. This luxury 4-star hotel benefits from the Chakra Spa, offering a sauna, steam room, swimming pool and fitness centre. Guests can also take advantage of the on-site restaurant for their dining needs or head to the bar to relax and unwind with a drink. To make your stay even more enjoyable, there is now a 20% discount exclusively for APH customers to redeem on all food in the restaurant and bar areas. Combine your stay with parking at APH, where your car will be parked in a safe and secure environment, giving you peace of mind while you’re away. Balance bar to assist guests when entering and exiting the shower or bathtub. Whilst the Crowne Plaza has a swimming pool, it is only accessible to children at specific times. You must give your car registration to reception on arrival to avoid any parking fine. Suitable for up to two adults, double rooms are furnished with a standard-size double bed. Suitable for up to two adults, twin rooms are furnished with two standard-size single beds. Suitable for 2 adults and 2 Children. FM4's are furnished with a standard size double bed and a pull out sofa bed. Upgrade your stay with a superior Club Room! These beautifully furnished, spacious rooms, have added touches to make your stay extra special! With super king size hypnos beds you’ll be in for a great night sleep. As well as a flat screen TV and free Wi-Fi, Nespresso coffee machine, courtyard views and a comfy sofa to relax on, guests can enjoy complimentary bathrobes and slippers. Each guest will receive two vouchers per day entitling them to a selected complimentary drink and crisps served from our Qube bar. Drive to the hotel and park with them overnight free of charge – enjoy your stay! Please be aware that Parking Eye is in effect. Please enter your car reg details at reception to avoid a parking ticket. 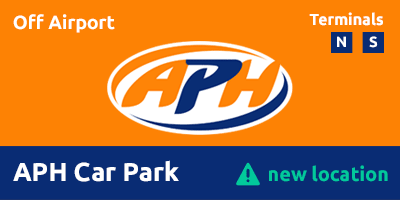 On the day of your flight drive 9 minutes to the APH Car Park and catch the free 10-12 minute transfer which runs 24 hours a day every 15 minutes to both terminals. On return take the transfer back to the APH Car Park to collect your car.